L 6″ (15 cm). Squarish tail. Song is series of warbling notes that end in “zeee” lacks musical trills and rolls. 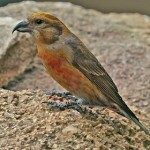 Description: Adult male has brown cap and brown upperparts; front of head, throat, breast, and rump are usually red but can vary from orange to yellow; underparts are streaked with brown. 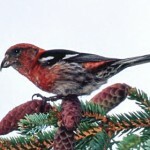 Females and juveniles are brown-streaked overall; lacks white facial markings. 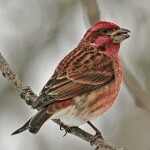 Habitat: Open woods, river bottom thickets, scrubby vegetation, ranchlands, and residential areas. Where in Nebraska: Locally common permanent resident in both eastern and western Nebraska. Least common in the Sandhills. Status: Eastern and western populations are a result of rapid immagration into the state from both directions during recent years. The entire state will likely be colonized within a few years. 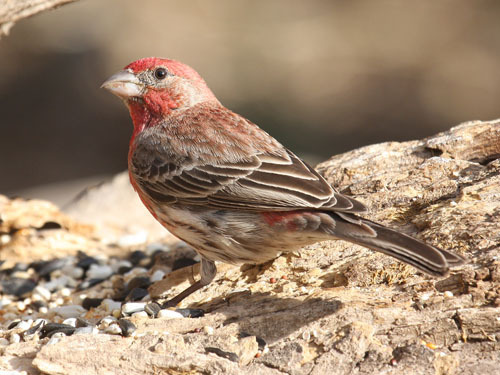 Fun Facts: House Finches were originally introduced in Long Island, NY in 1940 where they flourished and have spread all over the United States.